So what? I'm a busy guy. I thought I was going to have more time to post some videos, pictures, and blurbs on the current fishing situation around here, and I was wrong. It's been a while since I had time to post anything, but in my line of work, that's a good thing! It's been a great summer, and the hopper fishing is absolutely, out of control!!! The Trico's, flying ants, crane flies, Hecuba's, (about a size 10 green drake looking, monster, oh my word the trout love 'em, may fly), BWO's, and more are yet to come. Yikes, it's going to be an awesome late summer/ early fall! 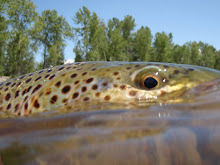 With the rains we just received driving our rivers up to even better levels, to smack trout in, we are looking at the most optimal fishing conditions our area has seen in the middle of August in over a decade. 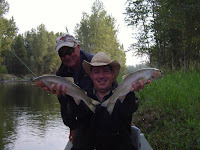 Throw in our second year in a row with the spruce moth hatch on the Blackfoot, and hang on to your spool my friend! It's on! OK, I've waited for this for at least two weeks, and now I just can't help myself. One) Fishing is the best it's been in years here. Two) You haven't caught a fish over 18 inches in two days. Three) You haven't caught a trout over 18 inches in two years. Four) All our rivers are in amazing, fishing shape. Six) The big ones are "dumber than a box of rocks". Seven) There's more hoppers than ever in our area this year. Eight) Fishing is insane, and our major, late summer/ early fall, and fall hatches haven't even started yet. Nine) Dry fly enthusiasts may literally fall out of the boat over how good it is! "A blind, one armed monkey could easily catch a twenty incher after drinking a fifth of vodka, and casting with a banana, out of one of our boats this summer or fall"! Take it however, but grab a camera with a big chip, or a lot of film, and come see us this season for a Dry Fly Bonanza that will knock you wading boots off! Hope everyone is having a great fishing season, and I'll try not to wait so long next time for the latest fishing report. John, Great article in the Missoulian! You ROCK!